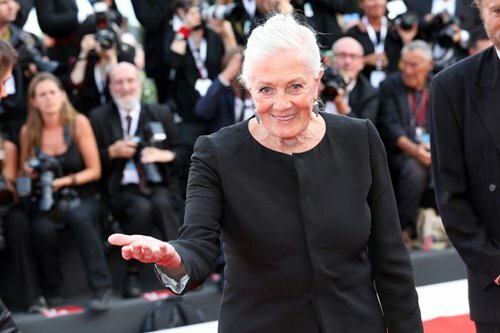 Legendary British actress Vanessa Redgrave made an impassioned plea on behalf of refugees while accepting the Golden Lion for Lifetime Achievement at this year's Venice International Film Festival on Wednesday. The acclaimed 81-year-old actress, who is considered a national treasure in her home country, made her directorial debut in 2017 with the documentary Sea Sorrow, starring Ralph Fiennes and Emma Thompson, which examines the current global refugee crisis and which premiered at the Cannes Film Festival last year. "Not enough people know the facts [about why people become refugees]," Redgrave told reporters at a press conference on the Lido, the long narrow island that faces the city of Venice where the celebrated film festival is held every year. Redgrave said she became aware of what it means to be a refugee at the age of 4, when she was evacuated from London along with her siblings during World War II, while her uncles and her father were in the Navy fighting the Nazis. "We were war children," she said. "Our entire mentality was consciousness of the war." Redgrave bemoaned the fact that European governments are not telling their citizens that "helping refugees is a national duty," as the British government did during World War II. Public opinion has become insensitive to the plight of refugees because "they have lost all understanding of reality" and "they have lost touch with what it means to be a woman who has lost her child at sea," she added. Born into a family of stage and screen actors in 1937, Redgrave over the course of her 60-year career has received six Academy Award nominations, winning an Oscar in 1977 for her performance in Fred Zinnemann's Julia. She has also won a Tony Award and an Olivier Award for best theater actress, as well as a Best Actress award at the Cannes Film Festival for her performance in Morgan: A Suitable Case for Treatment, by Karel Reisz, in 1966. That year she also delivered a memorable performance in Michelangelo Antonioni's iconic New Wave film Blow-up. Among her most recent works, in 2018 she performed in The Aspern Papers by Julian Landais with Jonathan Rhys Meyers and Joely Richardson, Mrs Lowry & Son by Adrian Noble with Timothy Spall and Georgetown by Christoph Waltz with Annette Bening. The Venice festival, now in its 75th edition, runs through September 8.